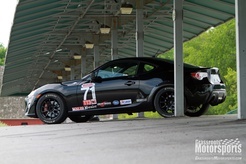 For a track or autocross car, the FR-S’s running costs are low. The 17-inch tires are cheap, and it makes a nice amount of power reliably for its weight. Modifying one is affordable as well, and you can snag suspension upgrades and more without breaking the bank. It’s also inexpensive enough now that many enthusiasts can get a used one as a second car or toy. If you’re looking for a used one, try to grab a stock example. See if you can get the maintenance history. It’s nice to know if it’s received regular oil services on the motor, transmission and rear end. 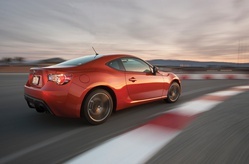 The only real competition for the FR-S/BRZ that’s lightweight and rear-wheel drive would be the Miata. Each car brings something to the table, but for me the FR-S makes the most sense. Its fixed roof works for track day clubs that don’t love convertibles–BMW, I’m looking at you. Plus, it has a little more power, a back seat and, for me, superior looks. When we started FT-86 SpeedFactory, we had two cars in-house. We used them to drive to shows in California, hauling E-Z Up tents, parts and more from Iowa. We’d then do track days at Auto Club Speedway and Big Willow, then drive back home. On the second trip out, one of the cars had a Vortech supercharger kit on it. We drove it there, did two track days, and drove it home. We completed the One Lap of America in 2013 with no problems. It’s very reliable. FR-S maintenance is basic; it’s a simple car to take care of. Changing the oil is about all we do to the cars to keep them rocking. Both cars have nearly 30K miles on the clock–all they’ve ever done is get abused. We recently removed the supercharger kit from one car and and replaced it with a turbo kit we developed. The cheap, basic mods are the standard ones: air filter, exhaust and tune. Those three will get you some power for a little bit of money. SPC rear camber arms ($208), camber bolts up front, 17-inch Enkei RPF1s, 255-series tires and an anti-roll bar get you a potent little track toy. You can stuff decent meat under this car. With a 17x9-inch wheel, you can fit 255/45R17 tires on all four corners with the stock suspension. With an 18x9.5-inch wheel, you can get 265s on all four corners once you have coil-overs. Bilstein, ST Suspension and KW all have affordable options for coil-overs. Otherwise, RCE and Swift make nice lowering springs. A lightweight flywheel really wakes up the car, and so does a final drive gear change if you’re willing to get into things a bit more. We replaced the stock 4.1 final drive with an MFactory 4.67 unit ($750), and the stock 20-pound flywheel with an ACT XT 10.5-pound kit ($634 with clutch). I don’t think I would own another FR-S or BRZ without making those changes again. An ECU tune is your best bang for the buck for horsepower. If you can get E85 fuel in your area, you can get a nice chunk of power there, too. The possibilities on the crazy side of the spectrum are endless. There are tons of supercharger and turbo kits out there that bring power to the 230- to 275-wheel-horsepower range while keeping things reliable. There are LS motor swap kits out there as well. I would recommend the BRZ platform for road racing because it’s the most forgiving car I have ever driven on track, even with 500 horsepower. This car with our turbo on it is the craziest street car I have ever driven–the power-to-weight ratio and the excellent handling make it so. Handling improvements follow tried-and-true methods. Lowering the car, dialing in some negative camber front and rear, and installing stickier tires are all good moves. Crawford’s own Eco Block upgrade gives about 8 horsepower for $50 and just a screwdriver. No further tweaks necessary. The Crawford Billet Power Block ($340) can give as much as 19 horsepower without engine tuning. It increases the distance between the intake manifold and the cylinder heads, effectively lengthening the intake runners. An ECU reflash for E85 fuel can stretch this enhancement to 30 horses. A supercar power-to-weight ratio can be achieved with boost. The Crawford turbo kit ($6995) gives 430 horsepower and 500 ft.-lbs. of torque on pump gas and 500 horses on E85. Doubling the power and tripling the torque has a negative effect on the entire drivetrain, but if you can afford this power upgrade, you can afford the associated maintenance. Big power is fun, but it’s the trip from warp speed back to zero that can be a matter of life or death. A Brembo brake kit is good insurance with higher speeds. Join Free Join our community to easily find more Scion, Subaru and Toyota articles. So I was actually looking at the twins to replace my E36 M3 down the road, and I came under the impression that stock cooling is a potential concern on these cars. Am I correct in saying that an oil cooler is effectively a must for hard driving? Yep these need an oil cooler badly for any performance use, I'm surprised it wasn't mentioned as a necessary mod (I think it was in a previous GRM article). This is still on my list of maybe's after the Abarth. It was one of 5 or so I considered in early 2014 until the Abarth had a $6k rebate down to just over $20k brand new. I tried to buy an Abarth spider before I got my BRZ. Both are very fun. You can actually get Impreza/WRX crash-bolts from Subaru (or Scion) that will allow you ~-1.2ish degrees of camber. I think they were about $15 for the set when I had mine. A lightweight crank pulley also wakes up the response a bit (the stock pulley is about 5lbs, while most aftermarket pulleys from Kartboy, Perrin, etc. weigh about 1lb). Skip the intake and go for a decent panel filter instead (I got an Injen Short-ram on mine because I found one for cheap on the forums; it made the car bog and sometimes shut the engine off randomly, although it did sound nice a WOT).